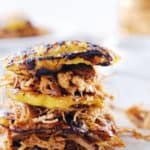 Smashed Plantain Pulled Pork Sliders! Ok, say that five times fast. This recipe was born because we went to a great little restaurant in downtown Bend called Barrio with some friends in town visiting us. On the menu they have these cute little pork carnitas sliders with fried plantains for the buns. They are super tasty, so we decided to make our own Paleo version using our crockpot pulled pork. 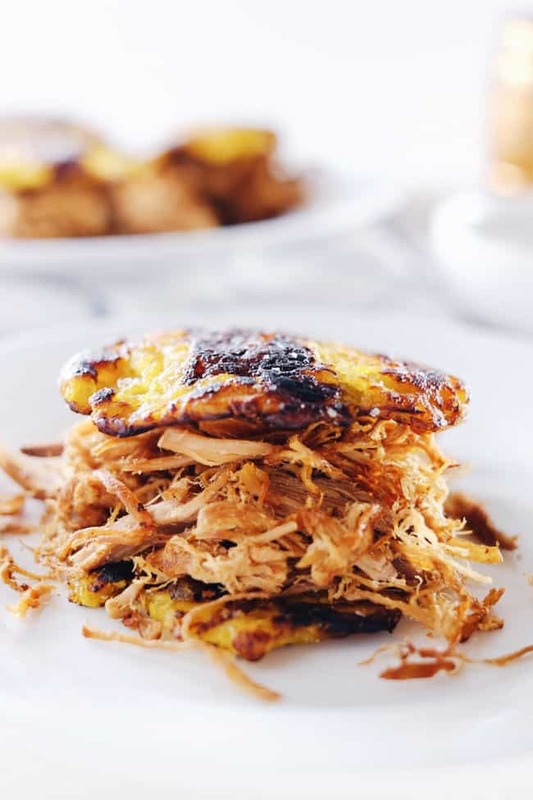 Two things we absolutely love are pork and plantains, so it is only natural to put them together for a tasty appetizer when you have guests over, or have a couple of them and make it a dinner. You can totally keep them simple, with just pulled pork and the smashed plantains, or add your favorite sauces and toppings. We like them simple, but have been known to add some mustard or Primal Kitchen Chipotle Lime Mayo! That stuff is so good! Just slap a little on (just about anything) and you’ll be glad you did! The smashed plantains are really quite easy to make. They are basically just twice fried. You fry the plantains once to soften them up, smash them, and then fry them again. The second frying really makes the edges nice and crispy, and the whole thing holds up well as a bun. The key is using green plantains because they will be hard and starchy (kind of like a potato) and be firm enough for a bun. Ripe plantains are too mushy to make into a bun (we tried and failed). Seriously though, these are an easy way to up your appetizer or dinner game! They feel like they have been catered. I can just picture them at a gathering with a little bar of toppings and sauces to go with! How fun and cute! 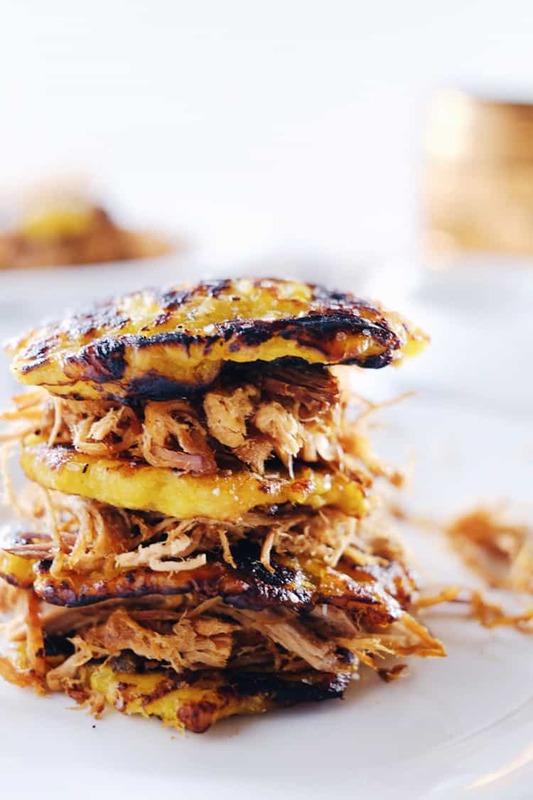 Or….you could just make stacks and stacks of smashed plantain pulled pork sliders like this! Look at the crispy and juicy goodness! Get in my belly! 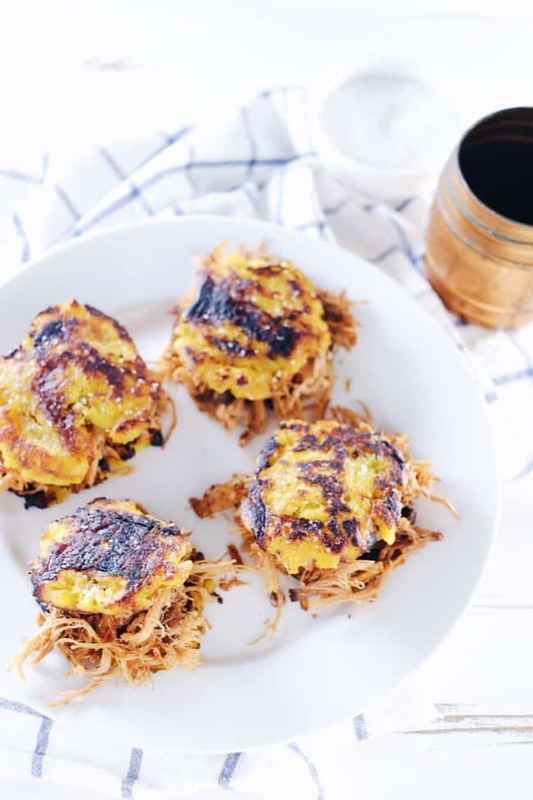 Make these smashed plantain pulled pork sliders, and let us know how it goes by leaving a comment below. Then, snap a photo, and tag us on Instagram @realsimplegood so we can see! First, prepare pulled pork according to instructions. Next, prepare plantain buns. Start by scoring plantain peels lengthwise with a knife, and then removing the peels. Slice plantains into 1 inch pieces (each plantain will make 5-6 pieces). Heat a large skillet over medium heat and add in 4 tbsp avocado oil to cover the pan. When the pan is hot, add in plantain pieces. Cook plantains on one side for approximately 2 minutes, until browned on one side. Flip plantains to cook on the other side. Plantains are somewhat shaped like a triangle, so you will need to flip them twice to cook all three sides. Cook approximately 2 minutes per side so each side is browned. Remove and place on a paper towel lined plate. Allow plantain pieces to cool for a few minutes until you are able to handle them. Smash plantain pieces with the bottom of a plate or other flat object to flatten. Once all pieces are flattened, heat skillet again to medium and add in more avocado oil if necessary to cover the pan. Cook flattened pieces 1-2 minutes per side, until browned and crispy but not burnt. Transfer to a paper towel lined plate and sprinkle with salt. Make sliders by using the plantain pieces as a bun. Place some pulled pork between two pieces of fried plantains and dig in! Hahaha! I love how perfectly timed it ended up being for you! We just recently got some new pork from Justin’s mom and she’s got little piggies again, so we are fully stocked as well! We will be making this again soon, too! Hope you love it as much as we do. A slaw to go with sounds amazing!! You’ll have to let us know how it goes! I’m always curious if people go for a creamy slaw or more of a citrus slaw! Thanks for visiting!! Love this idea so much! Now, to go and find some plantains for me. We love plantains and pork together! We get so bummed out when we want to make this and there aren’t any plantains at the store. Their availability can be hit or miss where we live, but it is so worth it when we can get our hands on them! Hope you enjoy this recipe as much as we do!